Juju helping me open the box. 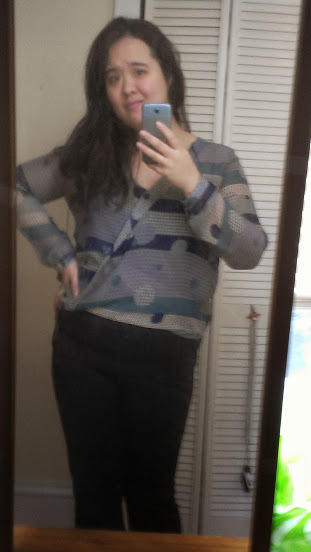 Like a good nosy Scorpio, I had Googled the names of all the pieces as they had shown up on my Stitch Fix account. As such, opening the box I had a pretty good idea of what I’d be getting for most of the items. So, I started with the one I hadn’t been able to find a picture for, the necklace. On my Pinterest, I had pinned a fair amount of the types of things I was looking for, in the hopes that my stylist would see it. So, when I saw that I was getting a necklace in this fix I was really hopeful. Once I opened the box though, I knew it wasn’t right at all. 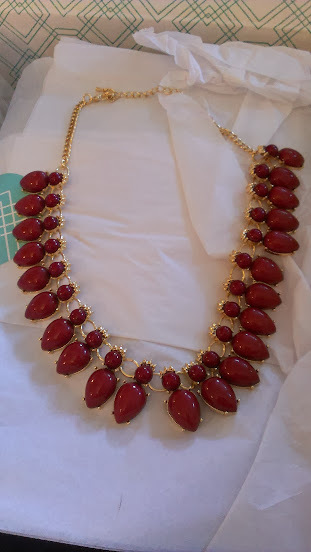 $28, Bay to Baubles. Cabochon Bugs Parade Necklace. The name already had me on edge and sure enough, the little things on this necklace did look like bugs. Creepy. The color and shape looked kind of Grandma-ish to me. Plus, I don’t even like gold all that much and had already relented on a gold colored necklace in my last fix. I sadly put it in the ‘no’ pile. Then I looked with trepidation at the thing that I was the most scared of when I had searched for it online. It didn’t look like my style from the pictures I had seen and, unfortunately, I turned out to be right. $58, 41Hawthorn. Lachlan Cross Front Long Sleeve Blouse. Seriously? Ew. Horizontal stripes? Horrible muted color palette? Short torso? No. No. No. There was nothing at all right about this top. I showed it to the bf, who described it as a grandma quilt drawn in a comic book. As it turns out, grandma’s quilt is also made of Kleenex. Um, guys? I live in Minnesota. To make matters worse, the sleeves were too small, causing the all too familiar phobia that I would rip this thing any second. Nothing like feeling like a fat oaf to give you a good confidence boost. 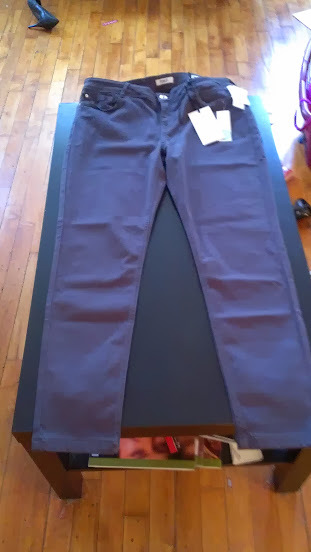 $88, Kensie Jeans. Kaleigh Ankle Biter Skinny Jean. With my slightly bruised ego, I then looked for something to raise my spirits. $68, 41Hawthorn. Florence Colorblocked Dress. Finally something I could tolerate! I’m typically a big fan of color blocking as it’s a good alternative to patterns, most of which I can’t stand. The thing with this dress was, again, the fabric. 100% polyester and not machine washable? What’s up with that? 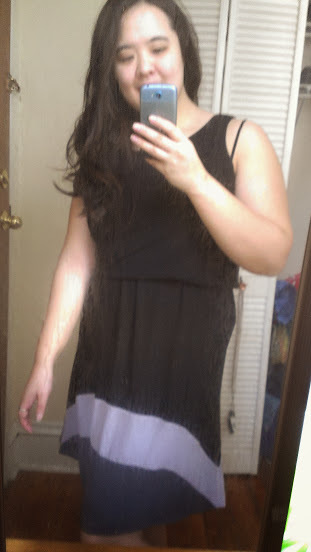 For me, this dress was an *almost* but not quite worth the amount of money. Ding ding! Finally we have a winner! Green isn’t normally a color I wear too much. Blue yes. Teal yes. Blue-green yes. But straight up green, not really. This top was sort of an evergreen color. 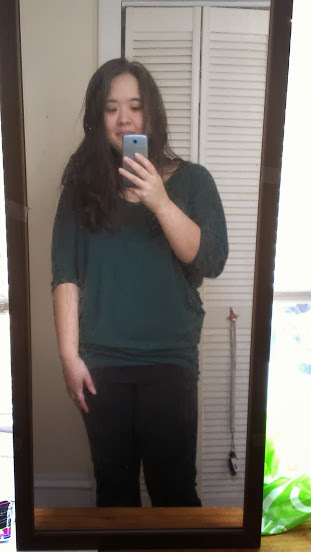 I was unsure of the sleeves on the Dolman style top but it actually looked pretty good on me! And, left plenty of room for my wide back and shoulders. I also liked how it was more fitted at the bottom. 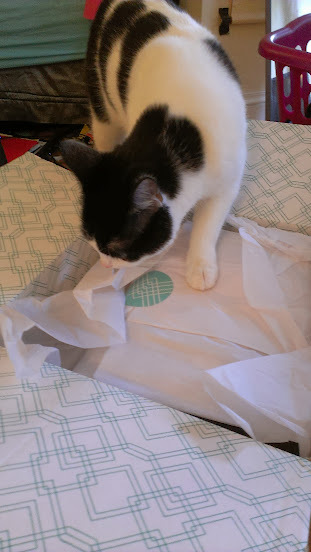 In general though, I was pretty disappointed with this fix as compared to my last one and made sure to let Stitch Fix know when I checked out. Here’s to hoping for a better experience next time. Interested in Stitch Fix? I get money if I refer you! Check them out here!